The Paddle Steamer Wagga Wagga was the last operational paddle steamer to ply the Murrumbidgee River. In September 1858, two South Australian paddle steamers, the Albury and the Lady Augusta owned by Captain Francis Cadell, casued immense excitement as they arrived at Narrandera on their way up-river to Gundagai. With pastoralism booming in the Riverina and bullock drivers charging 17-30 pounds a ton to cart stores up and wool down, the paddle steamers were attractive at 12 pounds per ton. In 1865 Victoria completed a railway to Echuca on the Murray. The steamers flocked to the new railhead. In Narrandera Shire, the paddle steamers lost their trade north of the river around 1882 when the Narrandera-Hay railway was built, and then south of the river by 1884 when the railway crossed the river to Jerilderie. After 1880, only one boatload of Melbourne good reached Narrandera. The Wagga Wagga was one of the last of the Murrumbidgee steamers. 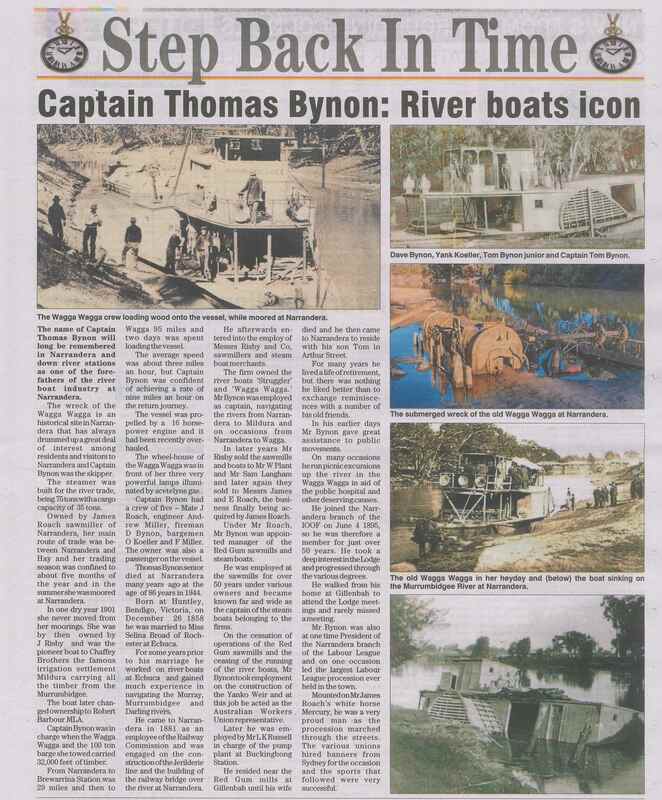 it spent 40 years servicing the waterways between Mildura and Wagga Wagga, carting timber, wool and provisions. 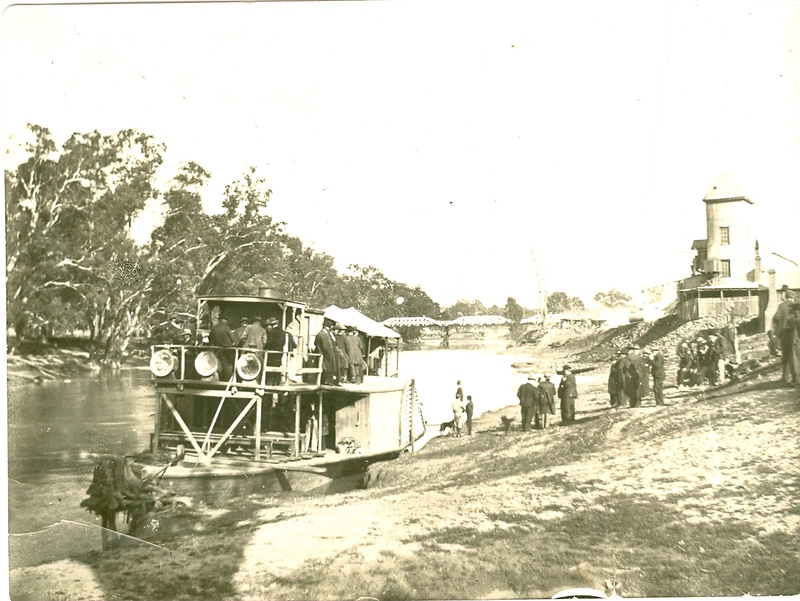 The famous paddle steamer, “Wagga Wagga” , the one which Captain Tom Bynon navigated the Murrumbidgee River between Mildura and Wagga Wagga, went to a watery grave near the railway on the 11 November 1918. The log book kept by Captain Bynon gave information concerning trips made by the “Wagga Wagga” as far back as 1884. Most of those were made to the downstream towns of Hay and Mildura, but occasionally the destination was Wentworth, at the junction of the Darling and Murray Rivers. The journey to Hay varied from three to five days, according to the amount of time spent en route delivering or loading cargo (timbre, wool and general cargo). By the 1890s, the “Wagga Wagga” also made many excursion trips in a bid to raise funds for the Narrandera District Hospital. On one trip on 29th October 1893, the vessel carried a record number of 240 passengers. 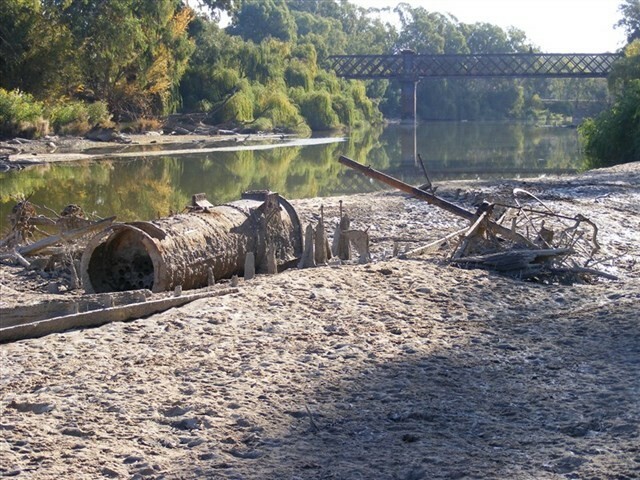 The PS Wagga Wagga now lies as a wreck in the river bed, and can be seen when the river is below 2 metre from the north side of the river. To find out what the current water level is visit Water NSW and click on Narrandera. Below is an article from the Narrandera Argus newspaper on 31 July 2018.